St. Martin's Griffin, 9781250130907, 384pp. It’s the ultimate in fantasy baseball: You get to pick the roster, set the lineup, and decide on strategies -- with real players, in a real ballpark, in a real playoff race. That’s what baseball analysts Ben Lindbergh and Sam Miller got to do when an independent minor-league team in California, the Sonoma Stompers, offered them the chance to run its baseball operations according to the most advanced statistics. 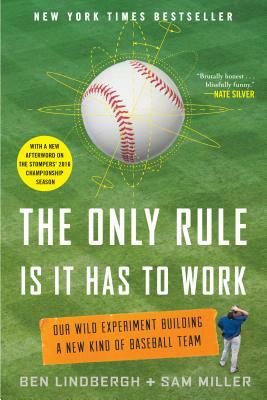 Their story in The Only Rule is it Has to Work is unlike any other baseball tale you've ever read. We tag along as Lindbergh and Miller apply their number-crunching insights to all aspects of assembling and running a team, following one cardinal rule for judging each innovation they try: it has to work. We meet colorful figures like general manager Theo Fightmaster and boundary-breakers like the first openly gay player in professional baseball. Even José Canseco makes a cameo appearance. Will their knowledge of numbers help Lindbergh and Miller bring the Stompers a championship, or will they fall on their faces? Will the team have a competitive advantage or is the sport’s folk wisdom true after all? Will the players attract the attention of big-league scouts, or are they on a fast track to oblivion? It’s a wild ride, by turns provocative and absurd, as Lindbergh and Miller tell a story that will speak to numbers geeks and traditionalists alike. And they prove that you don’t need a bat or a glove to make a genuine contribution to the game. Ben Lindbergh is a staff writer for FiveThirtyEight and, with Sam Miller, the cohost of Effectively Wild, the daily Baseball Prospectus podcast. He is a former staff writer for Grantland and a former editor in chief of Baseball Prospectus. He lives in New York City. Sam Miller is the editor in chief of Baseball Prospectus, the coeditor of Baseball Prospectus’s annual guidebook, and a contributing writer at ESPN The Magazine. He lives on the San Francisco peninsula with his wife and daughter.